Book brings the Justin Bieber: Steps to Stardom museum exhibit to the world! With the must-have book Justin Bieber: Steps to Stardom, Justin Bieber fans are treated to an intimate, behind-the-scenes look at the first Bieber museum exhibit in his hometown of Stratford, Ontario. Featuring a signed foreword by Bieber himself, the book is available to Beliebers worldwide! Justin Bieber: Steps to Stardom features approximately 100 colour photos of some of the most beloved pieces of memorabilia in the Stratford Perth Museum’s one-of-a-kind Bieber exhibit, as well as never-before-revealed stories behind what makes the items so iconic. The book also contains exclusive photos and stories about Bieber and his family that can’t be found in the exhibit. Copies of Justin Bieber: Steps to Stardom are now available for purchase here. Fans can order a special collector’s edition of the book personalized with their name on the front cover here. Written by Stratford Perth Museum General Manager John Kastner, who followed Bieber’s rise to fame during his 33 years as a journalist at the Stratford Beacon, Justin Bieber: Steps to Stardom features photos and stories of some of the most fascinating memorabilia that was lent to the museum by Bieber and his family members. 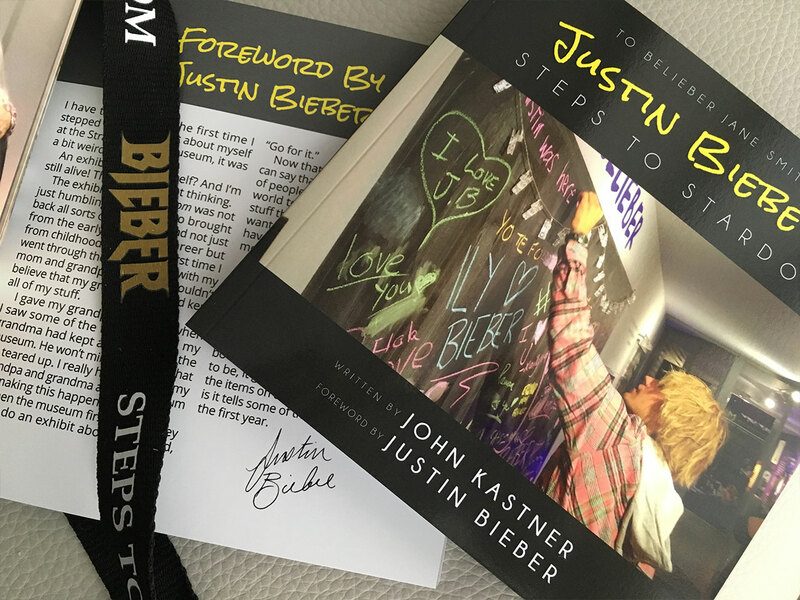 Kastner worked closely with Bieber, and his family was very supportive in developing materials for the book. Thousands of Beliebers from all over the globe have flocked to the Stratford Perth Museum since it launched its Bieber exhibit in February of 2018. Some of the pieces featured in the book are ones that visitors loved as well, such as photos of Bieber’s days busking on the streets of Stratford, a photo of Bieber and his mom with President Obama, and a hockey jacket from his Peewee hockey day with the ‘Biebs’ moniker, as well as dozens of personal pieces and awards from his music career.